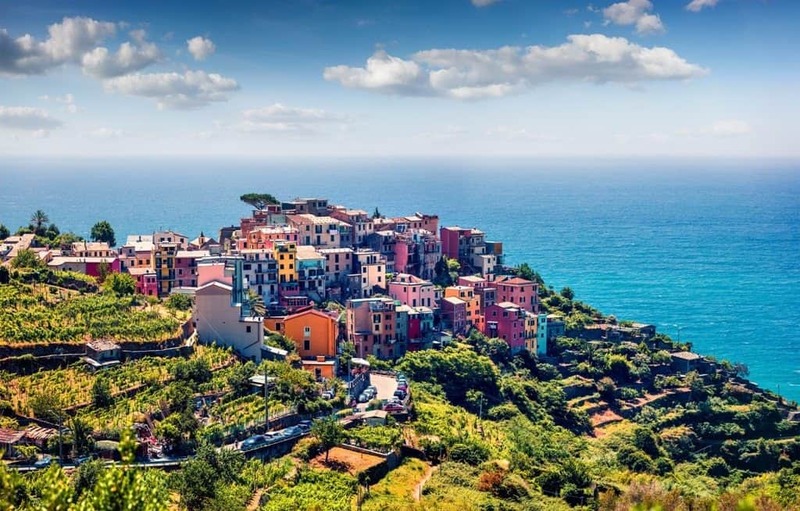 Cinque Terre (“Five Lands”) is a 10 Km long coastal area in the Southern part of Liguria Region, close to Toscana border and to the city of La Spezia. These “five lands” are five small villages located on top of cliffs and steep slopes overlooking the sea. The beauty of the rocky coast and the picturesque and colorful villages have made this area really popular and renown worldwide. The main activities are still fishing and tourism and they are also famous for their vineyards and the areas of terrace cultivations nearby. To explore them all, you can walk along the so-called “Blue Trail”, which connects the five villages and offers amazing views on both sea and hills. 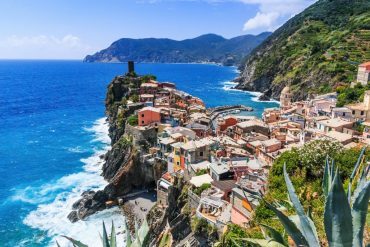 Cinque Terre area was included in the UNESCO’s World Heritage List in 1997 and it is considered one of the most beautiful landscapes in the world. It is the most populated village with about 1500 residents. 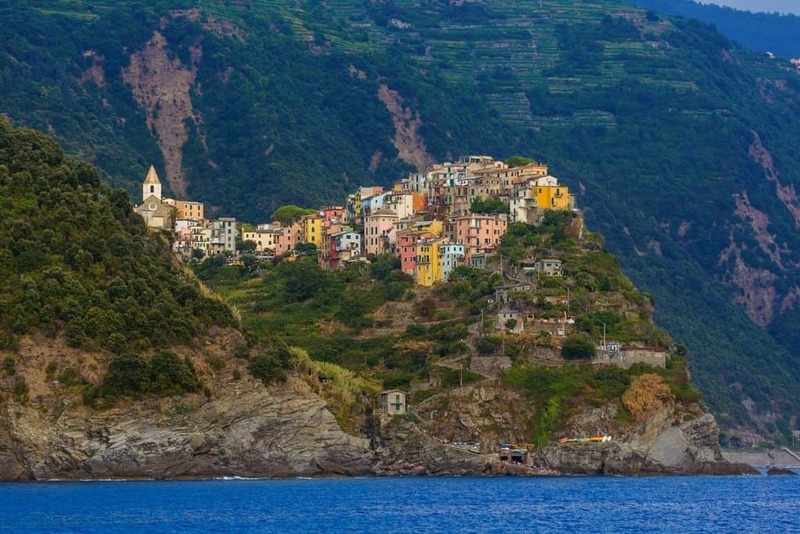 It is located in the Western part of Cinque Terre and it overlooks a small gulf. 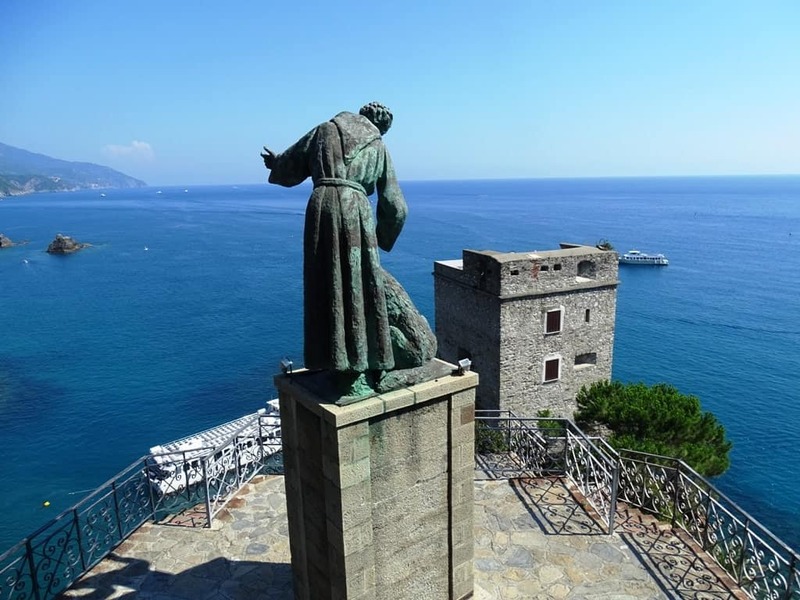 This medieval village has some interesting pieces of heritage, like San Giovanni Battista church and the Giant statue (or Neptune statue), which is a huge monument overlooking the beach and built in 1910. This place was also the summer residence of the Italian poet Eugenio Montale and you can still see his house. As for natural beauties, you cannot miss Punta Mesco, that is the promontory that encloses the gulf which offers a beautiful view from its ancient lighthouse. 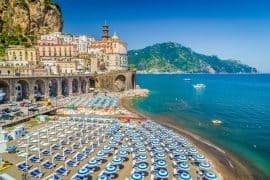 Pros: large sandy beach (the only one in Cinque Terre), several facilities for tourists and families and beautiful views. 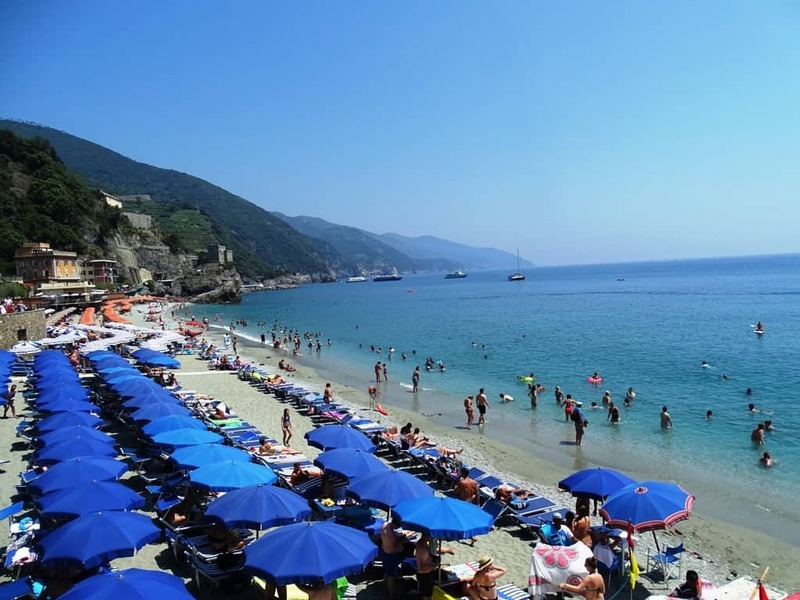 Beaches: Monterosso has the largest beach in Cinque Terre (Fegina Beach) and the only sandy coast. This makes it the most crowded place, especially in summer. There is also a smaller beach located in front of the old town, which is used as a starting point for the Blue Trail trekking. Trekking: Monterosso – Vernazza Trail – average hard, it takes 1h45. 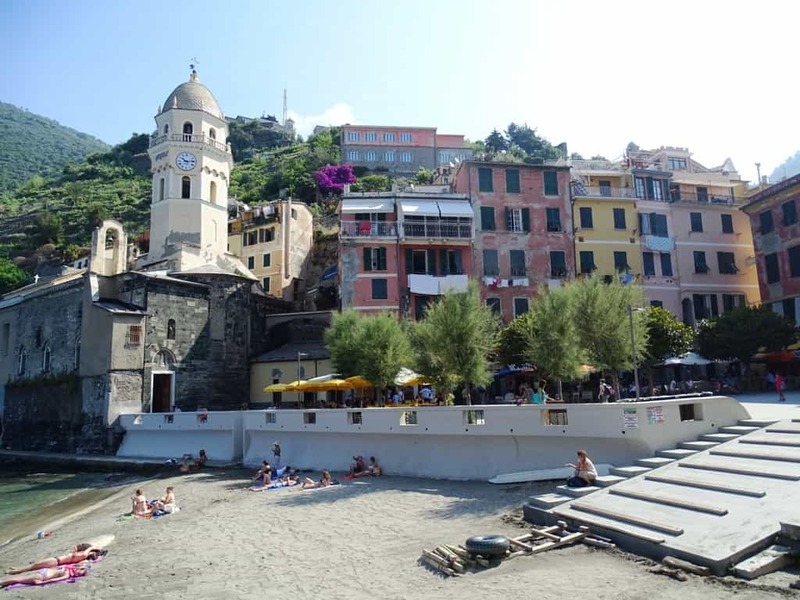 Monterosso – Levanto Trail – with a significant slope, it takes 2h30. Sport: trekking, swimming, sailing, biking. Is it for you? you are searching for a classical seaside vacation and you have kids. You like quiet and comfortable vacations with plenty of different activities for both adults and kids. How to get there: by train from Genova or La Spezia or by boat from La Spezia or another Cinque Terre village. 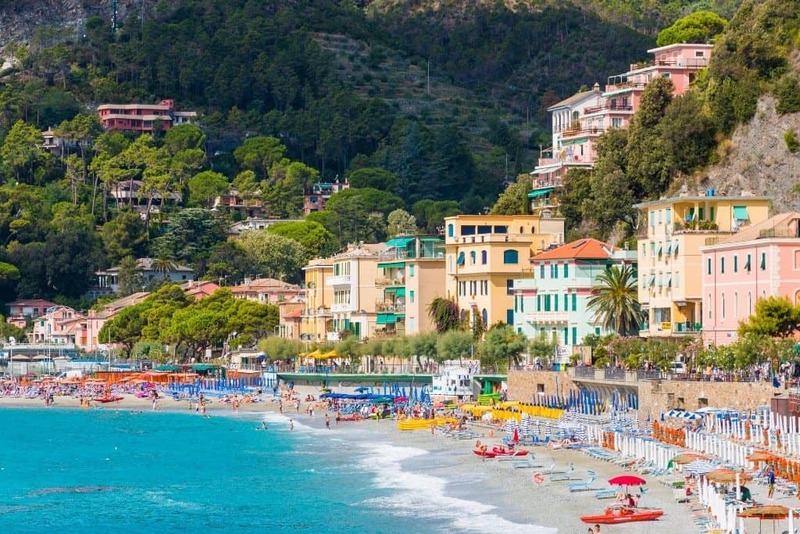 As Monterosso al Mare is the last town of the five towns, it’s a popular spot to stay overnight. La Casa di Zuecca is a beautifully designed modern hotel in the centre of town, steps from the beach. The hotel offers breakfast on the terrace, and all cafes or wine bars are only metres away in town. If you have a car, unfortunately, there is no parking here and parking in town will cost upwards of €25. Check the latest prices and book La Casa di Zuecca here. Locanda Il Maestrale is also located in town, in an old 18th century building that overlooks the historic town. The rooms here are spacious suites, with ensuite bathrooms, a minibar, and complimentary breakfast on the terrace, but it is not suitable for families as it is an adult-only B&B. Check the latest prices and book Locanda il Maestrale here. The second village you’ll encounter on the Blue Trail. It is surrounded by vineyards and just above the town you can see the Sanctuary of Nostra Signora di Reggio (easily reachable by a 2 Km trail). Vernazza is renowned for its vineyards, its lemons and the olive oil production. Pros: many trekking trails and a beautiful rural landscape. Beaches: a tiny beach is located less than 200 m from the train station, so it’s really easy to reach. Close to the main square, you’ll find another small beach, but you can only reach it by going through a natural cave. Trekking: Vernazza – Monterosso Trail – steep but beautiful, it takes 1h45. 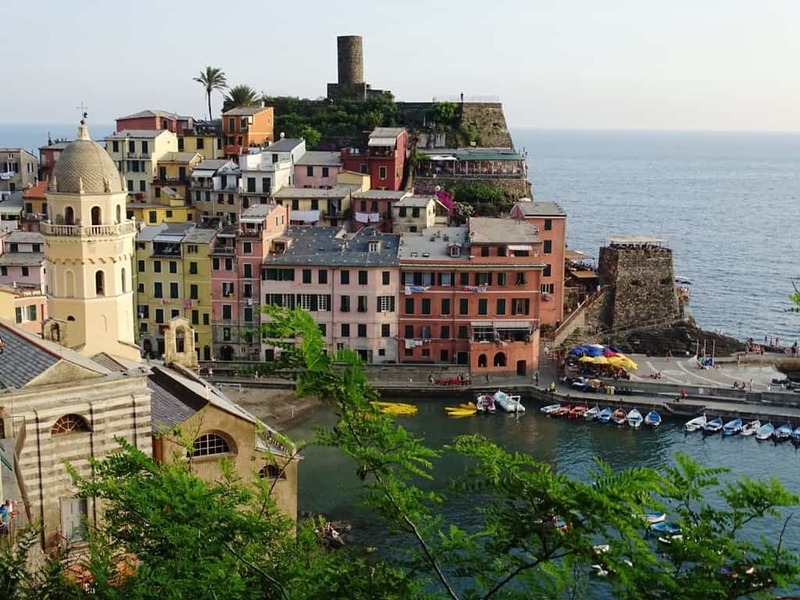 Vernazza – Corniglia Trail – average hard, it takes 1h30. Sanctuary Trail – easy and partially paved, it takes less than 30 minutes. 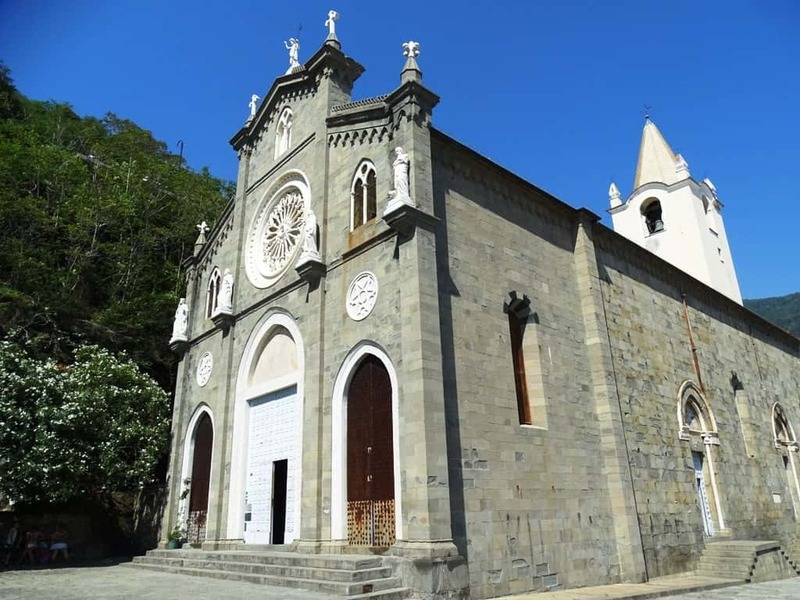 Culture/Art: Sanctuary of Nostra Signora di Reggio and Santa Maria di Antiochia Church. Is it for you? You are young and you love outdoor activities and trekking. You don’t care about comfort. 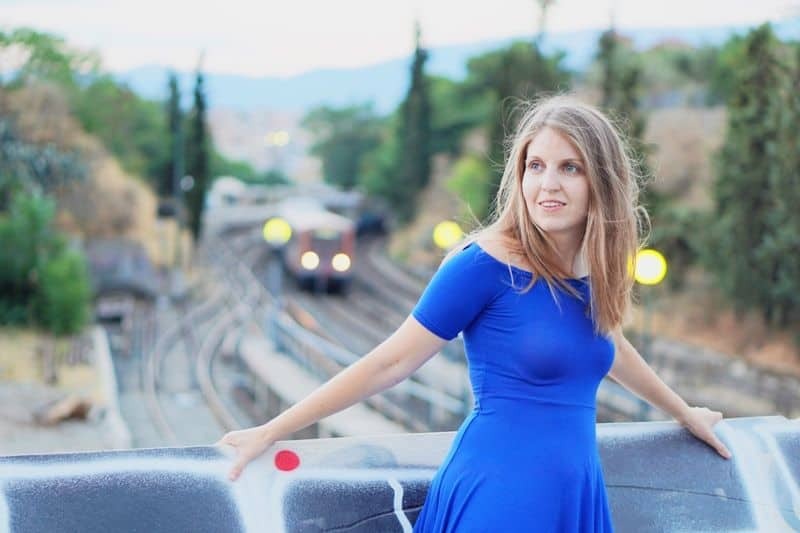 How to get there: by train from Genova or La Spezia or by boat from La Spezia or another Cinque Terre village. The main beach is just in front of the train station. 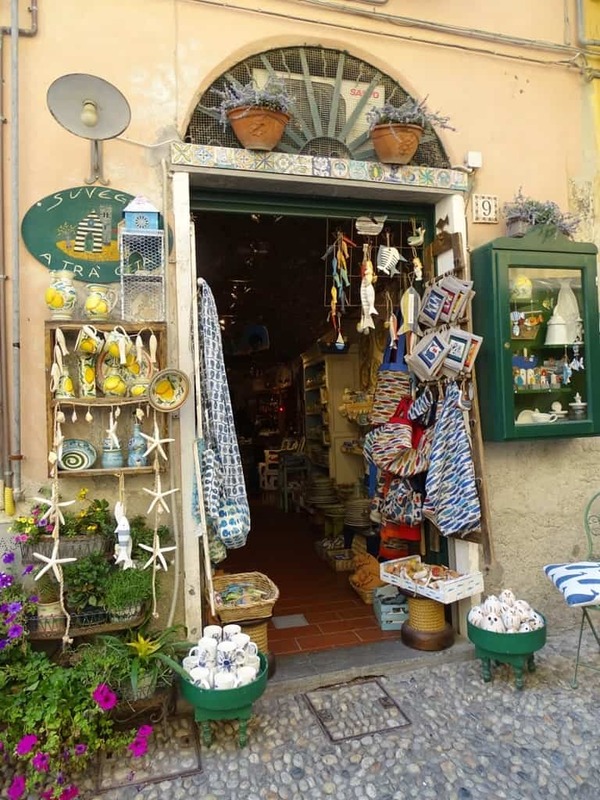 Vernazza is one of the most popular towns and as a result accommodation in town can be scarce at times. If you have a car, the Cade Ventu is a great hotel. Located a little more than 3km from town, the pet-friendly hotel offers spacious rooms with balconies or terraces and a complimentary breakfast. 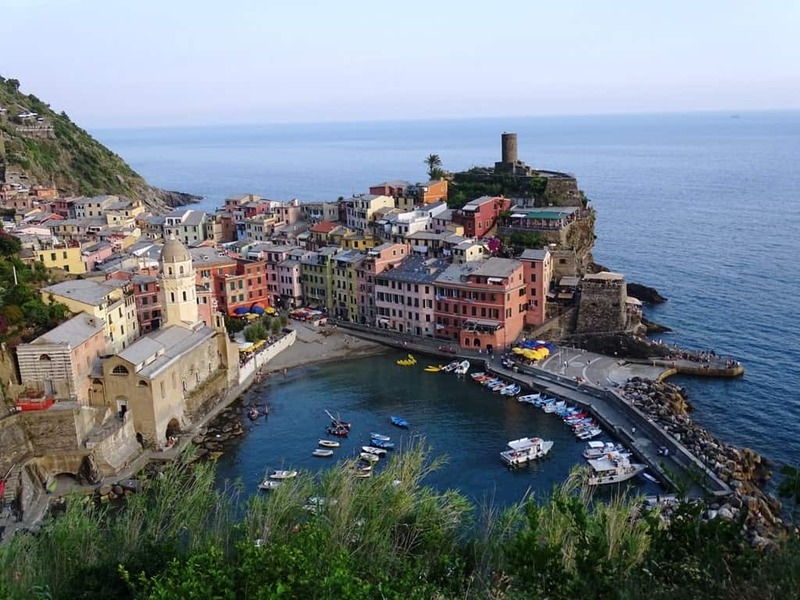 Cade Ventu is on the coast between Vernazza and Corniglia, with spectacular views across the sea. It’s a great spot for families as they also offer an apartment. Check the latest prices and book Cade Ventu here. Another ideal spot for families is The Terrace. The self-contained flat is located in the centre of town (I suggest not taking any heavy luggage, as there are quite a few steps!) and is just a few steps from the train station. 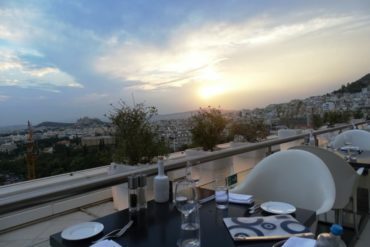 The sun terrace is the perfect place to enjoy your home-cooked dinner or to savour the late afternoon sun before heading to town for an aperitif. Check the latest prices and book The Terrace here. 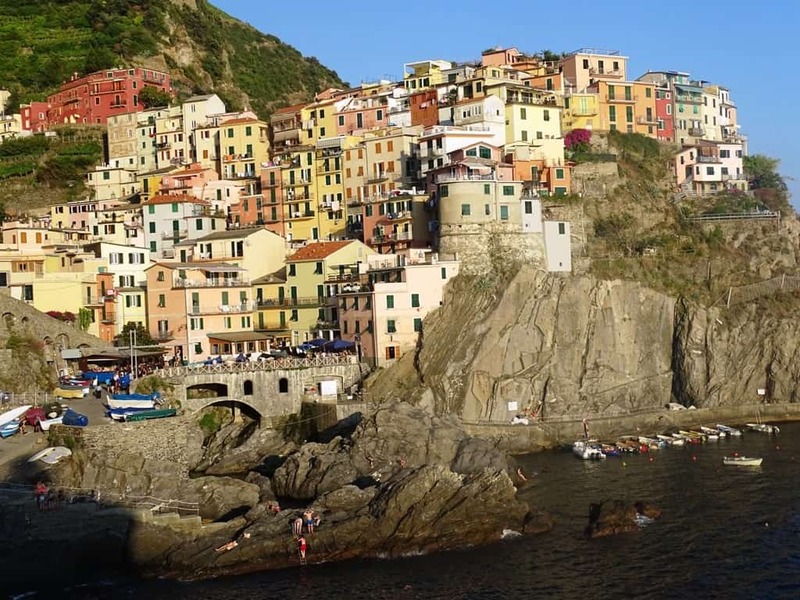 It is located in the middle of the Cinque Terre area and it is the only landlocked village. It is located on top of a promontory overlooking the sea and it surrounded by vineyards. It is a really tiny village, so there are no pieces of heritage, but in the local Saint Peter’s Church an annual organ festival takes place during summer. Pros: the most picturesque village with a beautiful rural landscape nearby. Cons: tiny village and uncomfortable beaches. Beaches: Guvano beach is small and it is difficult to reach (only going through a tunnel or walking through a steep slope from the Blue Trail), but it is quiet and isolated. Just below the village, there is another rocky beach that is inaccessible in case of rough sea conditions. Is it for you? You are searching for a trekking area with beautiful views and natural landscapes. You are not interested in sun-bathing nor in entertainment. 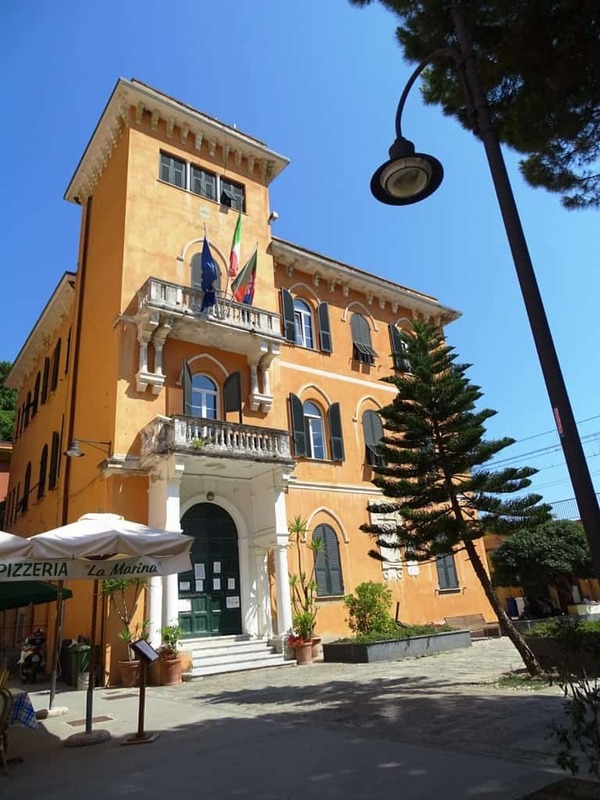 How to get there: by train from La Spezia or Levanto. Once you have arrived at the station, you have to climb 400 stone steps to reach the village above. You can also reach Corniglia by boat from La Spezia, Genova or another Cinque Terre village. 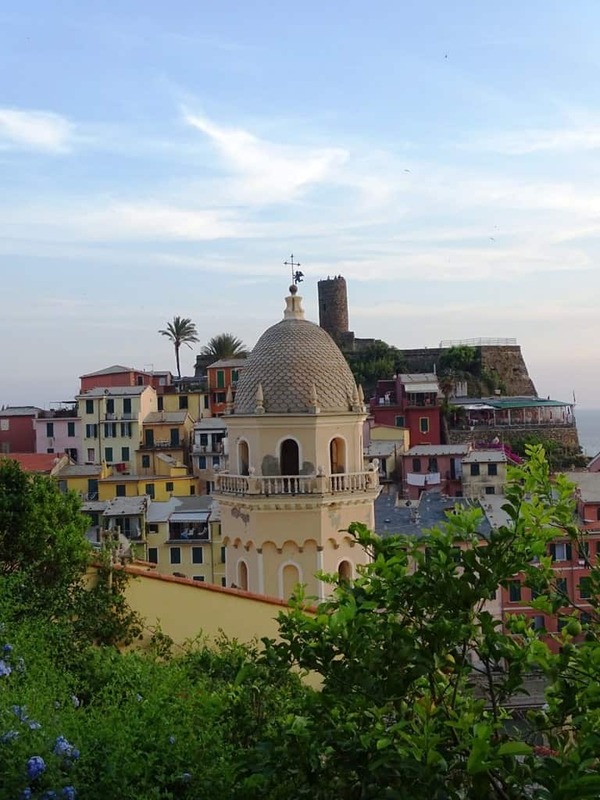 Corniglia, is often less crowded than the others as an overnight stay. B&B da Beppe is a charming bed and breakfast in the heart of the town. Rooms are comfortable, if maybe a little small, but come equipped with kettle and coffee/tea making facilities, an ensuite bathroom, and views across the town and sea. Owner Beppe gets rave reviews from past travellers thanks to his warm and engaging personality. Check the latest prices and book the B&B da Beppe here. Il Timone lies a one-minute walk from the beach. The rooms are quaint and comfortable, some with terraces, and the location for both beach and town is ideal for couples or families. Check the latest prices and book the Il Timone here. An ancient village clambered up a steep hill. 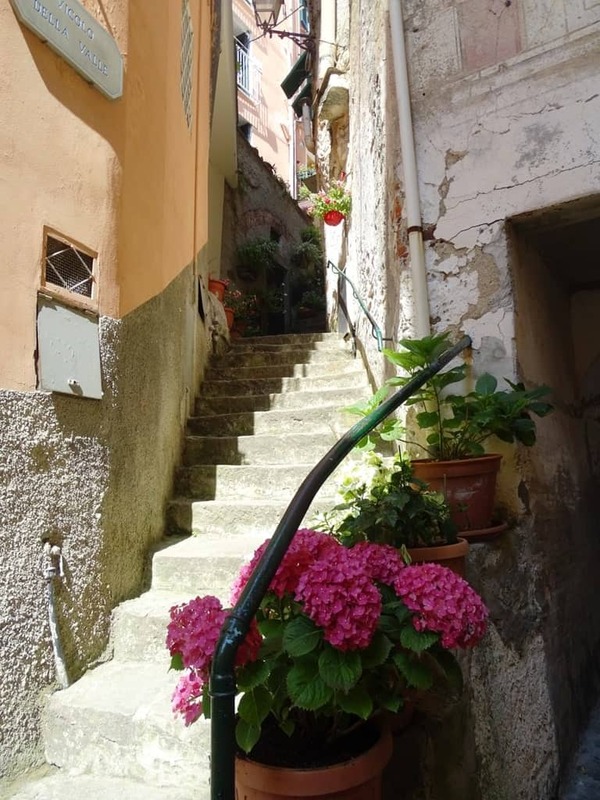 It is made of a network of narrow alleys named “carrugi” and typical of several towns in Liguria (like the historic city center in Genova). The village is built around the ancient castle, which is now a private mansion but still recognizable as a defensive building. Manarola is famous for its “presepe” (nativity scene): in December, a bright crib is built upon the hill, with figures covered with many lights and visible from a great distance. Pros: beautiful scenery, both in summer and winter, and many facilities for outdoor activities. Beaches: the main beach is located near the port. If you don’t mind walking, you can also reach another larger beach located 3 Km away from the village. Trekking: Punta Bonfiglio Trail – on the top of the promontory you can find a playground for kids and a bowling green. 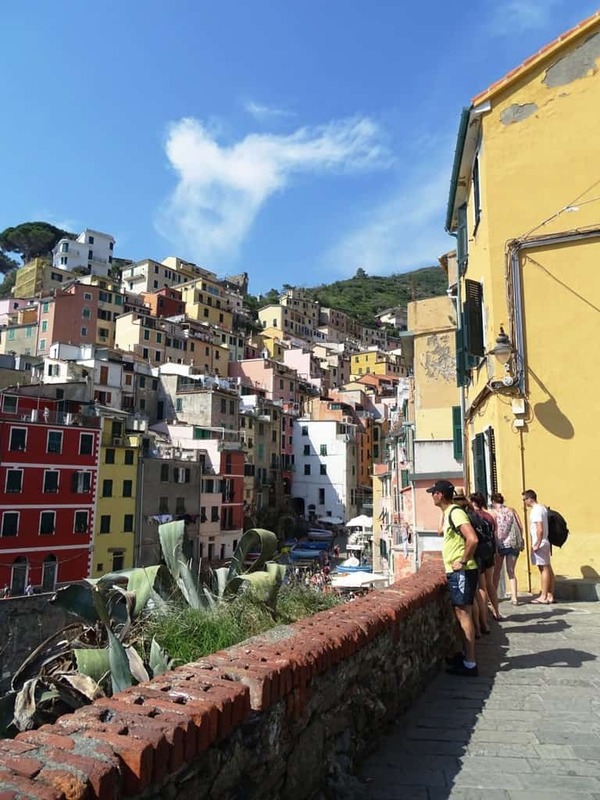 Manarola – Corniglia Trail – easy, it takes 2h30. Sport: kayak, swimming, sailing, trekking. Culture/Arts: light crib in December. Is it for you? You are searching for a place where you and your kids can do several outdoor activities. You are searching for a seaside resort where to spend your Christmas holidays. 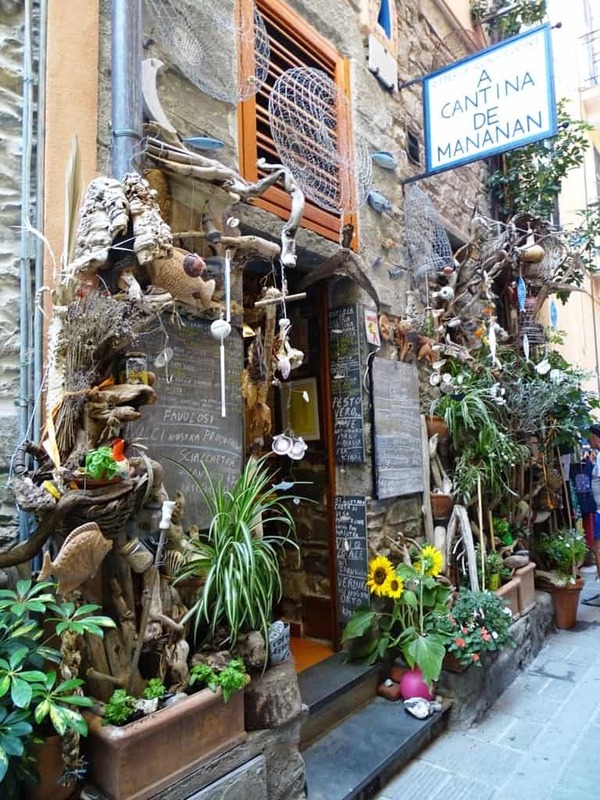 Ca’ D’Andrean is located in the centre of Manarola, the second town in Cinque Terre. Rooms are bright and spacious with modern, geometric decor. There is an onsite bar, lush gardens, and a small terrace. 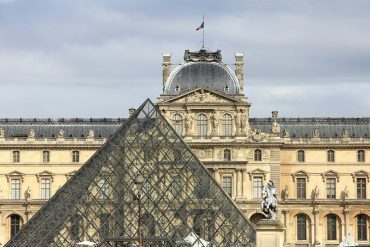 Check the latest prices and book the Ca’ D’ Andrean hotel here. The small (11 rooms) La Torretta hotel offers a reception each evening, complimentary breakfast, a complimentary non-alcoholic minibar, and coffee/tea facilities in the room. Despite being in a medieval building, the rooms at La Torretta are modern and serene. 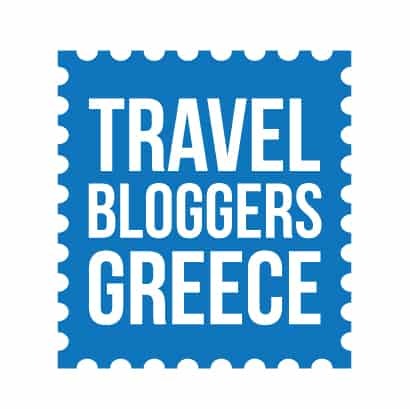 Check the latest prices and book La Torretta Lodge here. 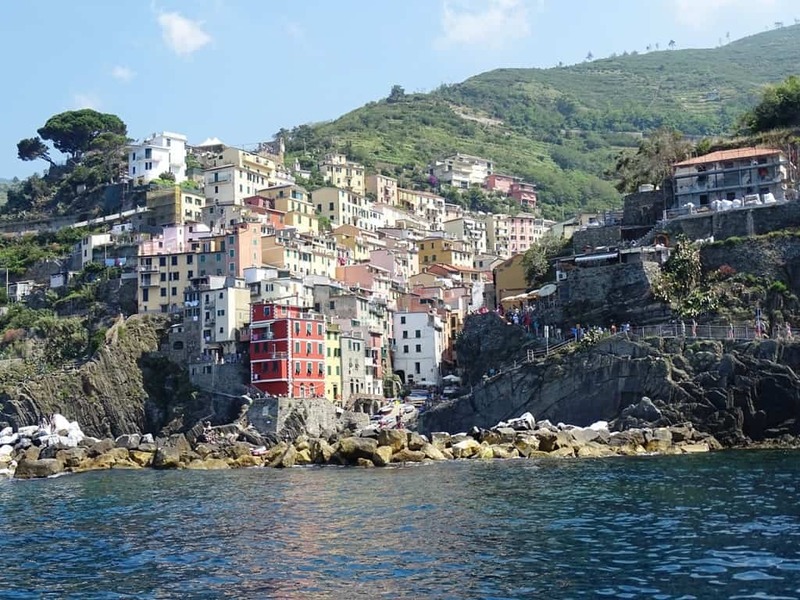 Check out how to spend one day in Cinque Terre. The second most populated village in Cinque Terre. It is built between the coast and the mountain slope, along Rio Maggiore stream. Its houses and buildings are narrow and tall, to optimize the small portion of building land. Pros: picturesque village with beautiful views on both sea and hills. Cons: small car park and winding roads, so that driving is not a good idea. The most beautiful beach is only reachable by the sea, so if you don’t want to rent a boat and spend more money you cannot enjoy it. Beaches: small rocky beach near the train station, with a sheltered position that makes it perfect in case of wind. Canneto Beach, which is only reachable by boat, is a wild and beautiful beach with a small waterfall streaming down from the top of the hill and into the sea. Trekking: Riomaggiore-Manarola Trail – steep but short, it takes 1h. Sanctuary of Montenero Trail – quite easy, it takes 1h30. Sport: swimming, sailing, scuba diving, trekking. 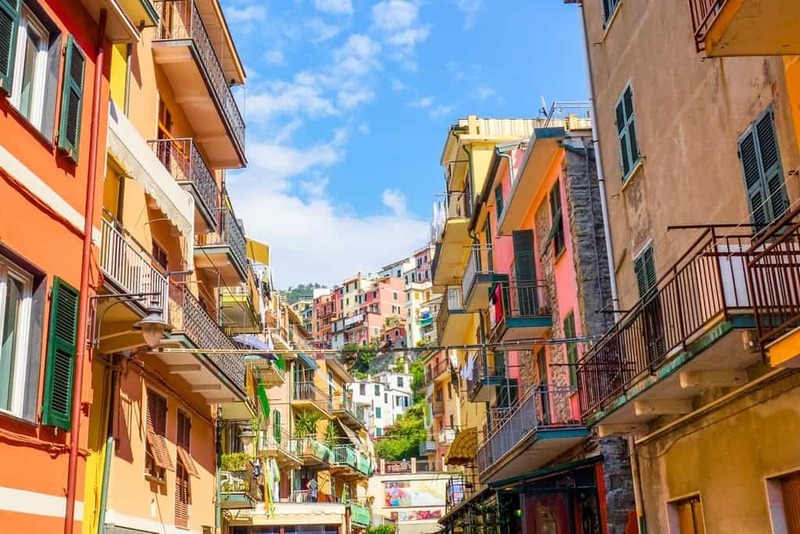 Culture/Art: Riomaggiore is divided into two parts: the lower fishermen’s village and the upper farmers’ village with their distinctive atmospheres. Is it for you? You have kids and you are searching for a place with many facilities. You cannot decide between seaside and countryside: here you can have both! 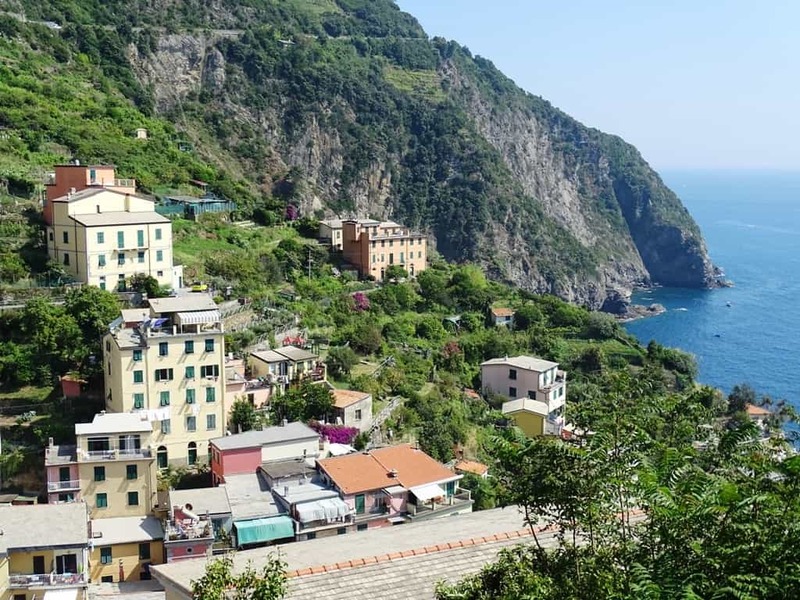 Riomaggiore is the first (or last) town on the popular Cinque Terre hike, which means staying here is a great option if you are hiking the trail. The Case Vacanze Scorci di Mare is a 3-minute walk from the beach in a 114th-centurybuilding. Renovated with eco-friendly materials, the hotel features beautiful wooden beams, modern bathrooms, and spacious bedrooms. Check the latest prices and book the Scorci di Mare Hotel. The Locanda Ca Da Iride is above town, a 9 minute walk from the beach, and features beautiful views over the descending town.Its cozy rooms are clean and inviting and the family that runs it is warm and welcoming. 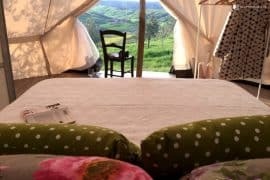 Check the latest prices and book the Locanda Ca Da Iride here. Get Your Guide is a great company to book your tours and tickets. Cinque Terre wine tour visit a working winery and sample the wine accompanied by local snacks. 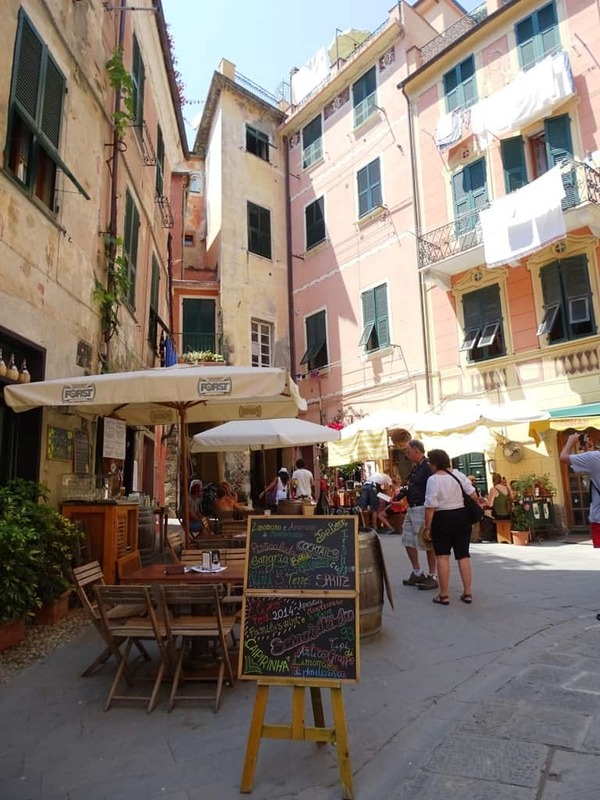 Cinque Terre walking tour with food and wine tastings explore the villages of Cinque Terre and then enjoy some local delicasies on a terrace overlooking the Ligurian sea. Cinque Terre sunset cruise with food and wine. Enjoy a sunset cruise with a local fisherman and see the beautiful villages from the water. Cinque Terre Kayak tour. Kayak along the spectacular Cinque Terre coast from Monterosso. 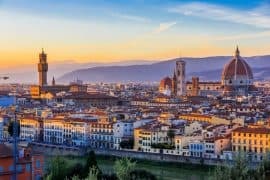 Things to do in Tuscany. 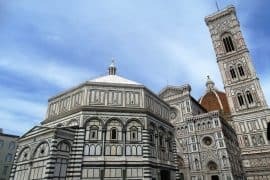 A 4 – day Florence and Tuscany itinerary. Things to do in Pisa in one day. How to spend one day In Milan. Things to do in Verona. 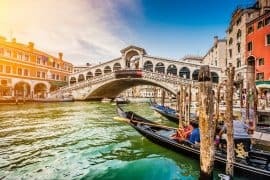 20 cities to visit in Northern Italy. 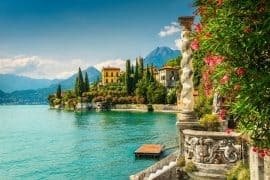 Things to do in Lake Garda. The best town in Lake Como. How to spend two weeks in Italy. What to pack for Italy from May to October. A guide to winter in Italy.